Update: Day 1 of E3 2015 has officially come to a close, but it wouldn't happen without one last look at EA's new Star Wars Battlefront. 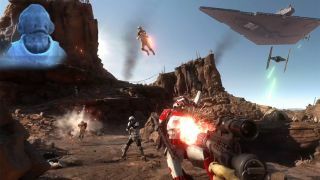 The second trailer (you can find the first down below) shows us a battle on a barren rock-planet that could easily be mistaken for Tatooine, as well as a brief glimpse of the game's "horde" mode that will pit you against wave after wave of storm troopers. EA's got us excited about Star Wars Battlefront for awhile now and finally we know more thanks to its E3 2015 conference. You'll be able to fight in 40 multiplayer battles like the The Battle of Hoth. The trailer below demoes teams as the Empire, accompanying AT-AT walkers marching towards the Rebel base to destroy it while Rebels must defend and stop them. Star Wars Battlefront will be available on PS4, Xbox One and PC on November 17, 2015.